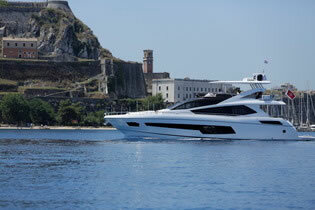 M/Y FINEZZA Sunseeker 75 is a luxury motor yacht offered crewed for charter in Greece and Greek islands. 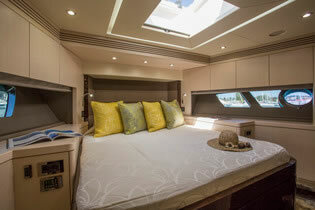 The Yacht was launched in 2014, is in immaculate condition, has accommodation for up to 8 guests in 4 cabins plus a crew of 2 and is the perfect yacht for exploring the stunning Ionian Greek Islands. Anchor off a new bay each day, swim and snorkel in the warm seas or simply sunbathe on the flybride while enjoying a cocktail or glass of champagne. 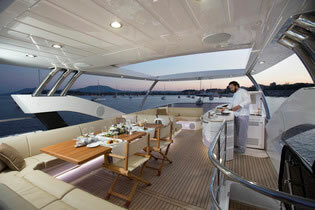 This Sunseeker has three spacious decks, with both modern and classic design. On the main deck signature ‘Z’-shaped windows allow plenty of natural light to illuminate both the dining and separate seating areas. 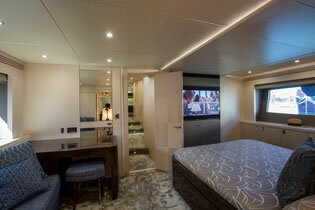 Below deck three double suites plus one twin bed guest cabin comfortably accommodate up to 8 guests. 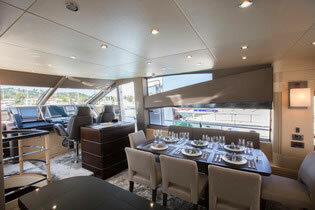 The large flybridge has wet bar, sun pads and dining area, while you enjoy cruising at 24 knots.